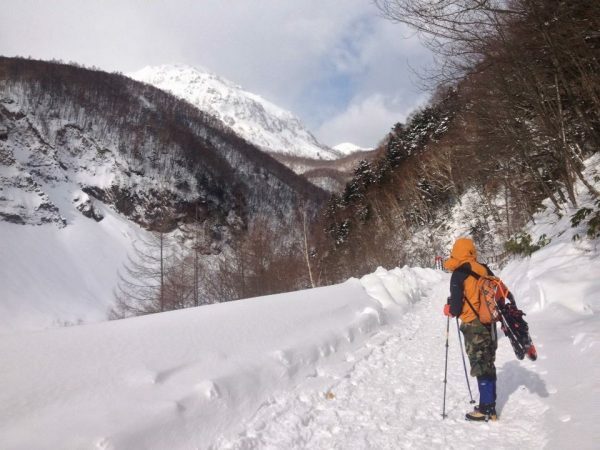 Just as I was running out of things to say about Kamikochi in winter, my good friends Brian and Shuko invited me out for a day of snowshoeing in the now very quiet and snow-covered park. Naturally, I jumped at the opportunity and picked up a pair of snowshoes for the journey. Even though we were just planning a day trip, visiting Kamikochi in the off-season requires careful preparation and all the right gear. I hope to write more about my experiences in an upcoming article, but for now, I’ll just give you the basics along with some photographs of the wonderfully serene mountain environment in mid-winter. Last Monday marked “Coming of Age Day” in Japan. Being part of a three day weekend, it’s a time when you can generally expect to see huge crowds at ski resorts and other seasonal hot spots. 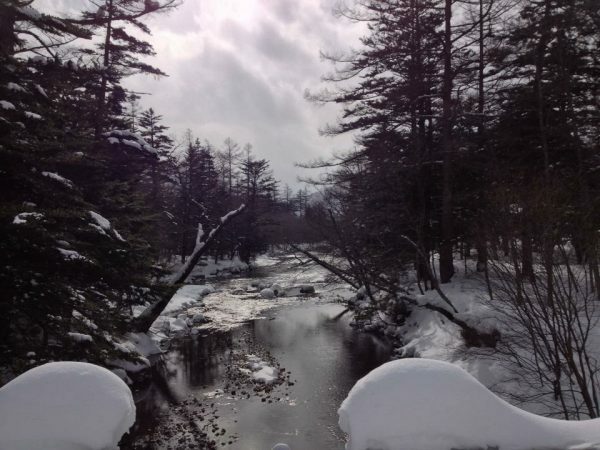 Kamikochi is the exception to this rule. With the Kama Tunnel closed to traffic, the popular hiking destination goes silent as the influx of hikers slows to a trickle. I myself had been planning a quiet day of cleaning up around the house, when I got a message from my friend, Matsumoto Backpackers co-owner, Brian O’Donovan. 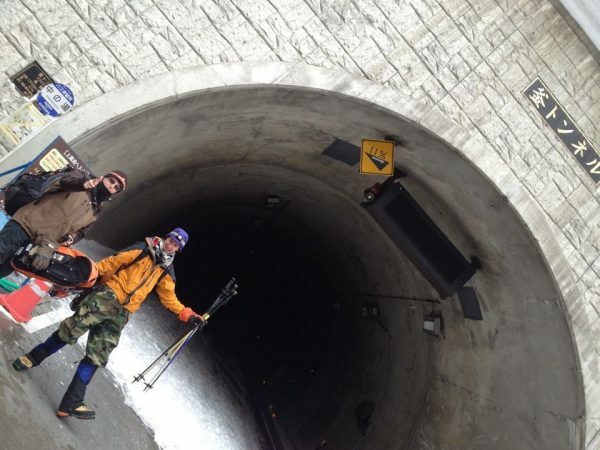 He wanted to know if I owned snowshoes and whether I was interested in an off season visit to Kamikochi. 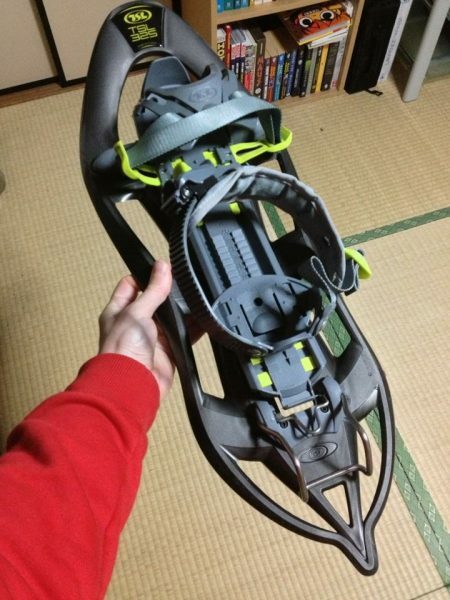 Well, I couldn’t very well say no to an opportunity like that, so I bit the bullet and bought a pair of mid-range snowshoes (nothing too fancy) for my first winter foray into Kamikochi. As it turned out, this was the only item I purchased new. 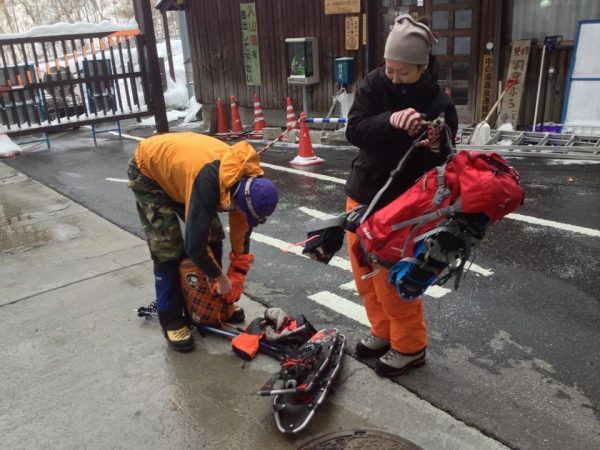 The ski wear I had used for years would suffice for cold weather gear and I had picked up other necessary items like gaiters and a headlamp over the past two years of hiking in the Japan Alps. Our plan was to depart Matsumoto by car at around 8:30, then race the Takayama-bound bus from Matsumoto Station up to Sawando and throw down 円980 for a short ride to the mouth of the Kama Tunnel. Having parked about 100m up the road from the Sawando foot onsen, however, we were approached by a taxi driver who assured us that we’d be better off going with him. It turned out that the taxi fare, split three ways, was about the same as taking the bus, so we threw our gear in the trunk and and proceeded by cab. As we had yet to encounter deep snow, we walked the first couple of kilometers without snowshoes. The first landmark to come into view was Mount Yake, which I had last seen bedecked in autumn foliage last September. A short time later, we were approaching Taisho Pond and a magnificent view of the surrounding mountains. Though we had originally planned to have lunch at Kappa Bridge, our hunger got the better of us and we hunkered down for a leisurely midday meal in the Tashiro Marsh area. In winter, no less than in summer, it’s important to make sure you bring all your rubbish with you after you finish up. We reached Kappa Bridge between 1:30 and 1:45, meaning that–not counting our one hour lunch break at Tashiro–it had taken us about two and a half hours to get from the Kama Tunnel entrance to our destination. We took a few minutes to savour the ambiance, with Mount Myojin towering before us, before starting the race back to the tunnel before sundown. Getting back to civilization proved fairly easy as the cabbie who had dropped us off had also given us a business card with the cab company’s number. We called for a cab to meet us at the Nakanoyu stop in 15 minutes, which is how long we figured it would take us to go through the tunnel. 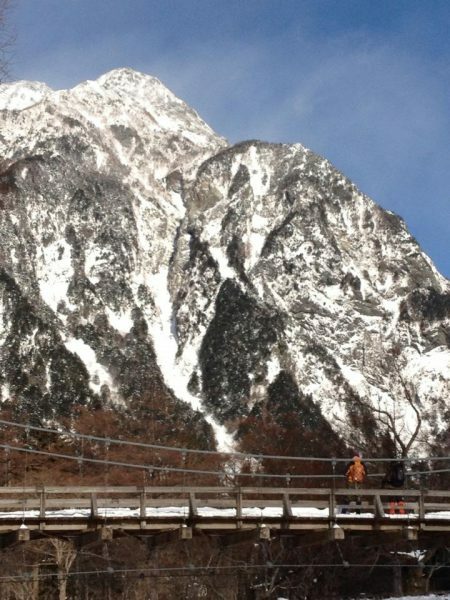 All in all, we had a great time amid the pristine setting of Kamikochi in winter. It proved very educational to me as I was able to learn from two more experienced winter hikers in the course of a leisurely day hike. The bottom line here is to take responsibility for everything you do and most of all, for your own safety. I learned first hand that, even on sunny days, things can turn uncomfortable in the blink of an eye, when the snow starts blowing or the sun disappears behind the clouds. Prepare thoroughly and always be mindful of how dangerous winter in an alpine setting can be. A big thanks to Brian and Shuko for inviting me to join them and helping to educate me in some of the specifics of winter hiking in the park. If you like what you read here and would like to know about the subject in more detail, be sure to like this post on Facebook (https://www.facebook.com/kamikochi). If there’s sufficient interest from our readers, I’ll be able to expand it into a full article here on the SHK homepage. That’s all for now. Keep warm and stay in touch this winter!